As promised I have a second project for you this week. This one was inspired by something I saw on the HGTV Message board. Of course I modified mine a bit. What is it you might ask? Well I consider it wall art. It's a collection of old spindles, in various shapes and sizes attached to each other in a hanging screen. These can be made as large or small as you like. I used eye hooks to attach the spindles to each other. I'd recommend not using the smallest eye hooks, but some that are a bit larger, with well spaced threads. The first ones I used pulled right out. This one hangs in my booth at Winnie & Tulula's. I needed something for the tall empty white walls. I'm also trying to show folks what they can do with spindles, as I've got lots for sale. This is a smaller version I have at my booth at Our Little Corner in Noonday. I'm so glad Garage Sale season is back in full swing. There are lots of great things out there just waiting to be found. Last week I found a group of 6 of these drawer sets. I think they were for microfilm. they stack and can even be locked together. These 2 sets are stacked on an old metal typing table that I have at Winnie & Tulula's(sold). I have 4 more of these drawer sets, LMK if you are interested and are local. I also found this fun and unusual item. these would be attached to old ambulances (station wagons) that belonged to individuals that contracted with the local towns to transport folks to the hospitals. These would be attached to their back windows. Here you see 2 hanging together, Notice the + plaque in each one. Not sure what these old rusty gear looking things are. The guy said something about seed spreader. Anyway, as seen at Judy Hill's show, Now it's an adornment for my mannequin. these would look great on the wall inside a frame too. And I picked this up yesterday. What a great old feeder. No room at either of my booth's for this piece right now, so it rests in my barn with the wind turbine. Next week I've got a few fun projects to share with you, so stay tuned. Are you ready? Is your calendar cleared? Have you called your friends to join you? The Red Shed "French Market" Sale is this Saturday. Join us Saturday, June 27th....8AM! Here is your next small glimpse to what will await you. The Red Shed Girl's Went to Paris in April and are now ready to share and sell their finds. They will remake the Red Shed into a Parisian French Market, and everywhere you look you will find the perfect item with a French Flair. Look for French writing, engraving, embossing, monogramming, or style. 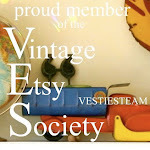 Most vintage and antique, some new, ....ALL FABULOUS! The Red Shed is a little hard to find on small Church Street just two blocks West of Main in Historical Downtown Grapevine, but everyone who finds it, agrees it was worth the search! Come be inspired by the multitude of ideas you’ll want to incorporate into your unique style. Yesterday I had a little tribute to my Dad. In it I mentioned his watch, and said there was a story behind it. As I thought about it, I realized it is a junking story, so I thought I'd share it with you. Maybe I got my junking gene from him. Who knows??????? One day dad came in the house carrying this broken watch he had found in the street in front of our house. It was a Bulova and the cool thing about it (for him) was that you could see through it to all the mechanics of the inside. He was a bit of a computer and gadget geek (that's an understatement) and loved this watch. He took it to a repair shop, had it fixed, and the crystal replaced. He wore that watch for the rest of his life. He replaced the band several times, but the watch remained a "prize" for him. Now flash forward a few years, I had started dating Roger (who I met at my parent's business). I had told Roger the watch story. Well one day, while talking with my dad, Roger looks at the watch and proclaims "I lost a watch just like that several years ago". Of course Dad was, as he would say it "flabergasted", but Roger couldn't keep a strait face very long and they both had a nice laugh. I now have the watch safely tucked away in a keepsake box. It stopped running years ago, and probably only needs a battery to get going again. You can see him wearing it in this pic taken in the 70's. When Roger saw me writing this post, he said "you have that?" I said yep, and he said he wanted to take a look at it someday. And my Dad's brother bought a Bulova that is see through because it was "like" dad's. I guess we never know what "thing" people are going to associate with us after we are gone. I'll keep the watch forever as well as a few other momentos from his life. His life was more than these things of course. But they are a collage' of the man who was, and a bit of what he left behind. I know I haven't had time lately to post any recent finds or projects, so here goes. This was a good Garage Sale Weekend. Here is what I found on Thursday & Friday. LMK if you see something you like. I will take some of it to the booth later this week. 2 sets of bicycle baskets, an old side table that needs some TLC. 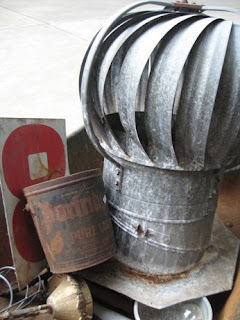 Not to mention a lantern, I love old lanterns. And here are a few things I picked up at last weekends Winnie and Tulula's Grand opening. Now it's a place for paper and pen in the guest room. I've coined a new word for our style at Winnie & Tulula's "Decorator Junk". Be the only one on your block with "it" whatever "it" is. Dad was many things, a computer pioneer in the 70's, raced motorcycles, and learned to fly both hang-gliders and airplanes, an avid photographer, Woodworker, HAM Radio operator, a genius and a member of MENSA. And he built a business that employed over 200 people at the time of his death. He's been gone for 26 years, I've know life without him, more than life with him. However, he was there through all those influential moments of my youth. Dispensing wisdom whether I wanted it or not (I do remember those pearls of wisdom even today). I'm mostly sad that my kids never got to know him, he would have been a wonderful Grandfather. He loved life, and enjoyed each day. Sometimes his temperment would interfere with other's enjoying each day, but we can overlook that. He wanted each experience to be full and complete, and packed a lot of living into those 39 years. My youngest Son recently said "When I die I want to meet 2 people in heaven. Elija and Your Dad." Wow!! that got me. Here's to you dad, you continue to influence me even though you are not here. Happy Father's day to my wonderful husband Roger and all the great Dad's out there, who keep everything working, the lawn mowed, the cars humming, and the greatest tools stocked for us junker wives. Take a day off, you deserve it. As if her just being here wasn't gift enough, Ki arrived with a very special present for me. These bags are similar to the Mable bag, but are made with Vintage Flour Sacks. The Back is even cool, 2 pockets are sewn on the back with more flour sack graphics. Her sister Karla makes these. And it doesn't stop there, as you lift the flap there is more coolness. And I love how deep these bags are. Deep enough for a file, or folder, and even your favorite mags. I use it as a more professional gal would use a small brief case. But I'm not professional, I'm fun, and this bag is perfect. When I said "how will I choose which one to carry, Mable or Oliver? Ki, in all her wisdom, said "change them out with the seasons, one for Summer and one for Winter." Oliver is it for the summer. Thanks Ki, it was a great gift. I've been so busy lately, I haven't had time to post some of the cool finds I've been dragging home. And I love this mirror, as-is. It has character, and the silvering is weathered. Debbie calls it a "ghost mirror"
These unusual things are 2 rusty chippy swings, complete with chains. The swings are metal and each one is a slightly different size. Now what could we do with these? This is a fun item, Judy Hill had one at her sale, and had ice in it. The ice did not melt. It's got a spout at the bottom for liquid, but it doesn't drain very well. I think I'd use it for ice, or a plant. The lid fits on it, I just didn't want people to have trouble getting it off and think it was stuck. More of those gas station signs. These are flipping numbers. The chair is bar stool height, and oh so industrial cool. And I finally found myself a mannequin. this poor gal needed something for her modesty, a old simplicity pattern works. Unfortunately, she had only 1 arm. All these items are currently living at Winnie and Tulula's and are all for sale. I found a great little side table today, and a lantern. They are still dirty and need some TLC but I'll show them soon. Have a happy junkin weekend. I'm sure by now you are tired of hearing about Winnie and Tulula's but it consumed my last 2 weeks and so I've still got lots to say and show you. This is me with my friend Starla and her Daughter. I'm actually talking to this lady about her dress. She looked so cool and classy. What do you think of my subliminal Arrow to get folks into the back room? Gotta give folks ideas of "what to do with it"
Ok, So Mindy and I are sitting talking, and David shows up with his camera. We are actually saying to each other "what should we say?" and "don't take my profile." Red Shed Val with her hands full. She's obviously in a shopping "zone"
I think Mindy is about to make a big sale. Notice me in the background. I'm busy emptying customers hands so they can continue to shop. This was one of many trips I made to the checkout. This is the sign for my "little store". It was Gloria's suggestion to etch "ruff" into a mirror. It was lacking something, and then I found the oval frame in a dealer's booth. That was just the thing It needed.